We showed you some pretty cool video from the Goodwood hill climb the other day but this footage makes those guys look like they were cruising barcaloungers through the English countryside. Here, you will see a camera mounted on the top of an open wheeled race car attacking an event called the Doune Hill Climb in Scotland. The driver, who may or may not be superhuman is a dude named Jos Goodyear (and if we were the tire company we’d be on the phone with this cat NOW) and to say that he is both fearless and exceptionally talented is selling him way short. 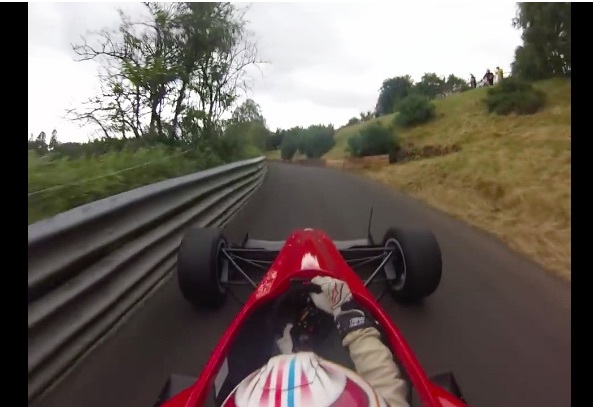 Hill climb racing has been a staple of automotive competition in Europe for a long, long time. There’s limited hill climb action here in the USA with events that range from the huge like Pikes Peak and the Mount Washington hill climb to vintage events that are far less intense than what you will see here. Unless we are really missing something, we’re not sure that there’s anything on the level of what you are about to watch going on here in the states. We’re talking about short courses (the whole lap here is 35-seconds), very narrow and sinuous roads lined with trees, and all the opportunity in the world to eat wood and shrubbery if any mistakes are made. The lap you are about to see broke the all-time record on this course (which is a dedicated course) that has been in use since 1967/1968 by a half second. That’s a big margin on a track that has been run up thousands of times. Simply put, this is a display of driving skill that we are awestruck by. Thanks to Jack Smithson for the tip! If this catches your eye…youtube a cat named Christian Merli. You will find hours of this kind of racing. Coool stuff. This guy’s kid was NOT born in a car in traffic……..